Geneva, 1 December 1999 — The lack of access to effective drugs in developing countries is part of a greater HIV/AIDS public health crisis. The epidemic has killed 16 million people in less than 20 years, and 33.6 million people are currently infected world-wide. Ninety five percent of people with HIV live in poor countries, and the vast majority do not have access to the most basic health care. Medecins Sans Frontieres no longer finds it sufficient to limit its HIV/AIDS work to prevention. Teams on the ground are now using a stepped approach: first implementing voluntary and anonymous HIV testing and basic primary care, then treating opportunistic infections. These elements need to be in place before antiretroviral drugs are introduced. In general, in poor countries few patients are treated for opportunistic infections, because there are neither drugs nor the necessary medical expertise. Yet, it is clear that treating opportunistic diseases would improve the quality of life of HIV/AIDS patients, diminish their pain and prolong their lives. In middle-income countries drugs to treat opportunistic infections are more often available but not always affordable. As health structures and medical expertise are developed that enable necessary follow-up of patients, antiretroviral medicines can be prescribed, but they also are neither available nor affordable. According to the World Health Organisation (WHO), in developed countries a course of one-year's treatment for HIV infection costs the equivalent of four to six month's salary. In developing countries one-year's HIV treatment- if it were available- would consume 30 years income. The price of Glaxo Wellcome's AZT in Honduras ($US 1.13 per 100 mg) is significantly higher than in Thailand ($US 0.67 per 100 mg). In Thailand the best wholesale price for a 100 mg tablet is currently $US 0.37. These high prices often mean the difference between life and death. The problem is particularly poignant with mother to child transmission. A short-course treatment using AZT in HIV-positive pregnant mothers has been shown to reduce transmission of the virus by 50%. In South Africa 60,000 children are born HIV-positive each year (life expectancy is 4 years). AZT could prevent over half of these infections. Another anti-HIV treatment, called nevirapine, has recently been shown to have similar results with a shorter course of treatment. Access to nevirapine also needs to be explored. High prices in many countries of HIV/AIDS drugs for opportunistic infections as well as antiretrovirals are maintained through the exclusive marketing rights granted to patent holders. This system is regulated by Trade Related Aspects of Intellectual Property Rights (TRIPS), one of the pivotal World Trade Organisation agreements. When the TRIPS agreement was negotiated it included provisions to ensure that health was not harmed by protection of intellectual property. This is accomplished by safeguard provisions which authorise countries to write national laws to protect public health. However, countries such as Thailand and South Africa have tried to apply this right for AIDS drugs, and have faced intense trade pressure from western governments. 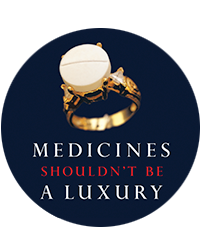 Medecins Sans Frontieres doctors refuse to accept that wealthy countries are preventing, through bilateral pressure, poor countries from realising their rights to produce less expensive medicines. Lower prices of opportunistic infection and anti-HIV treatments in poor countries. This can be accomplished by tiered pricing depending on country's level of income and voluntary licensing to local manufacturers. If companies are not willing to take these actions, national governments can issue compulsory licenses to ensure that people are not dying of curable diseases. Increased access to affordable AZT or nevirapine to reduce mother-to-child transmission of HIV, in the cases when infrastructures exist to effectively implement this strategy. These efforts are part of a larger MSF campaign to increase Access to Essential Medicines.